Image caption Paypal says that international transactions are still possible. 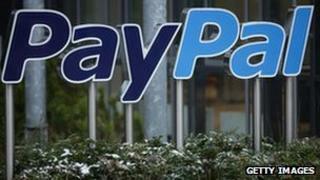 Paypal is to prevent users in Argentina from transferring money between their own accounts. The online payment service said that from 9 October: "Argentina resident Paypal-users may only send and receive international payments." Last year the Argentine government announced restrictions on the purchase of US dollars. It has led to an increase in currency sales on the black market - but Paypal's exchange rates are better. Locals were setting up two accounts under different email addresses and transferring money between the two, exchanging local currency pesos for dollars in the process. Under the new rules only one account per person can be registered within Argentina. The government's rules were designed to curb the flight of savings from the country and make the economy less dependent on the US dollar. When the news was announced, finance minister Amado Boudou - who has since become vice president - told the BBC it was "an important measure to combat tax evasion and money laundering". Since the rules were introduced in November 2011, Paypal has been used as an alternative means of obtaining the US currency close to the official exchange rate, which currently stands at about 4.7 pesos per dollar. That is much cheaper than the rate on the black market where one dollar costs about 6.3 pesos. Argentina suffers a high inflation rate - private economists say prices are increasing by about 24% a year. This adds to a general lack of confidence in the local currency caused by memories of its depreciation during the economic crisis of 2001. Many residents have tried to protect their savings against the risk of further turmoil by putting the money into more stable currencies. Economist Eduardo Marty told the BBC that currency restrictions had been extended to all economic activities, from the export of goods to foreign travel. "You have to apply for permission to import any goods," he said. "If you need to travel abroad the government gives you a meagre amount of money. Sometimes they approve it at the last moment and people are forced to buy on the black market." In September the government established a new 15% tax on all purchases made abroad, affecting credit cards and purchases made on international websites like Amazon and eBay, and transactions made on Paypal. Following local media coverage about complaints over constraints to the Paypal service, the company acknowledged that the blockades were imposed by local banks. In a statement sent to the BBC, Paypal apologised for the "inconvenience" the decision may cause. "Argentina is a very important market to us as we expand our global footprint, and we are currently very focused on providing Argentine merchants and consumers the best possible service. "Paypal customers in Argentina are still able to utilise Paypal for international transactions with 190 markets around the world," said the company. Reported by BBC Mundo, the Spanish section of the BBC World Service.